10 year old comic book author Sasha Matthews has come out with her second full length comic book, Pompeii: Lost and Found. In this new work, Matthews travels far back in time to the Ancient Roman city of Pompeii, just hours before the eruption of Mount Vesuvius. With fantastic drawings and action packed scenes, Matthews imagines daily life for a Roman family amidst Pompeii's natural disaster. For Ancient history and comic book enthusiasts alike, Matthews' writing and drawings truly bring history to life. Sasha Matthews is a kid cartoonist who is now in 8th grade at a New York City public school. 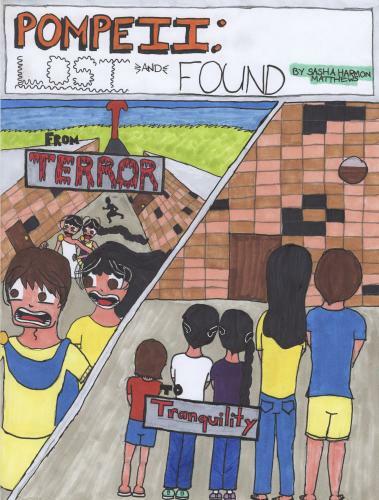 Local bookstores started selling her first self-published comic when she was in 5th grade.